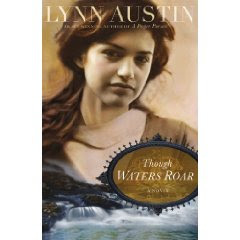 LibraryThing Early Reviewers program sent me an advance copy of Lynn Austin's newest book Though Waters Roar, scheduled for general release in October 2009. As twenty-year old Harriet Sherwood sits in jail, she ponders the irony that she has been arrested for transporting liquor at the advent of Prohibition, the very cause her grandmother has advocated for more than forty years. Lynn Austin skillfully weaves a multi-generational tale set between 1848-1920 introducing us to Hannah, Beatrice, Lucy & Harriet, their choices and the resulting challenges facing them throughout their lives. Set amidst the national themes of Anti-slavery, Civil War, the Temperance movement, and finally Women’s Suffrage, the attitudes and expectations of men toward women may surprise those unstudied in America’s history. Each woman’s attitude and reaction toward their situation is compelling and varied. The book is particularly powerful in its faith message of turning to and trusting in God during desperate times of trial. When Beatrice leaves her husband, her mother firmly counsels her to return to her husband and fight for him through prayer for God to help her husband overcome his weakness. That their bond was a vow made before God for better and worse, and that times of trial do not mean quitting and giving up. In today’s casualness of marriage and vows, Lynn Austin’s characters demonstrate to the modern woman how to turn to God for strength in seemingly impossible moments. The rest of the counsel might surprise and anger you, as it did Beatrice, but in following Beatrice through her journey, we recognize the strength and power within ourselves by allowing God to work within us to change our circumstances through His will. As each character discovers this is not an easy choice, but a difficult, daily, conscience decision worth making. Other themes include the relationship between mother and daughter, social classes, marriage, love, business. Characters demonstrate that making the right decision is often the more difficult path to follow. The author does not ignore her characters weaknesses, but allows them to learn from their mistakes. The reader shares their love, frustration, anger, and other emotions as they share their lives. The trials faced by each character are similar to current situations we all face today. Sounds like a very good book - may I borrow it? I may have missed it, but is this a novel or historical novel or non-fiction? I want to post your review on FB after I know. It's a historical novel with a Christian message.